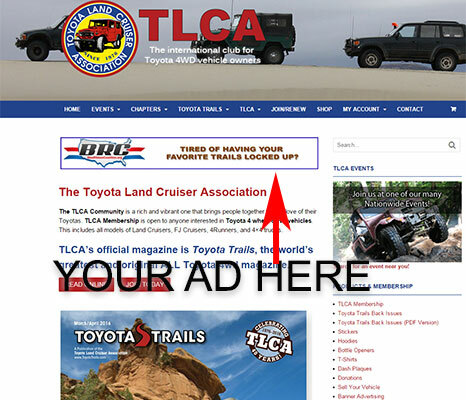 tlca.org represents a unified group of Toyota 4-Wheel Drive enthusiasts and will be successful in promoting a wide range of products. The newly re-designed tlca.org has allowed us to reach an even greater audience. With features like online classified ads, web forums and on-line access to Toyota Trails magazine, we are experiencing a steady increase in traffic volume to the website from existing as well as prospective members. As such, purchasers of tlca.org web banners are likely to get an exceptional value for the dollar. Ads are sold on a fixed rate basis and duration starts when the web banner is activated. Advertisers can receive ad statistics. Email campaign advertising includes an ad (provided by you) included in one email newsletter campaign with a link to your website or any special promotion or page. Limit 2 per year. *Ads will be reviewed prior to publishing and must contain content relevant to TLCA members. Web banners display like the example below and appear on the most visited pages of our site. Be the first to review “Web Banner” Click here to cancel reply.